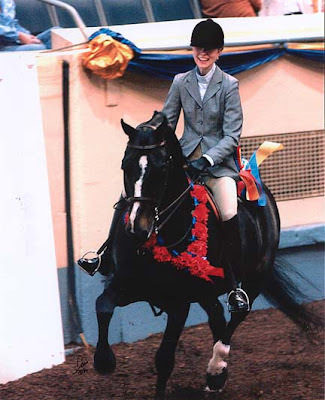 (Courage of Equinox * Valiant Aphrodite)The time has come for me to really sell my Rambo or “Ham.” He is the 2004 Junior Exhibitor Hunter Pleasure World Champion and holds world and national titles in the ladies, amateur and open divisions as well. Quite simply, he is a once in a lifetime horse and has been made extremely affordable by serious financial constraints. He is seventeen years old but behaves like he’s six with the size and stamina to remain extremely competitive in the hunter pleasure division for years to come. I figured out a way to keep him!!!!! I am beyond happy, this horse is my heart and the love of my life! thank you everyone for your kind words and wishes! Hey Allie, I don’t know if you’re ever at Judy’s anymore but I just got a new horse (finally!). Like I said, Rambo’s ALWAYS been one of my favorites, since all the way back to our days in Greenville. I’m so happy you’re keeping him!! (I figured out who you are (duh)but won’t call out your name haha!) I am so relieved and happy to have Ham home with me in CT (I am moving there, nearby my mom in the next month) and at a place I can afford. It’s funny, every time I thought I would finally have to sell him, some miracle occurred and the crisis was averted. Such was certainly the case this time. Anyways, I just finished up my undergrad at NYU and am applying to graduate schools for the fall of 09 – I plan to take Ham with me wherever I end up. I’ve heard through the grapevine that you have many exciting horses in your world these days! I wish you all the best!